Who Is Bobi Wine and Why Is He Creating Such a Fuss? A new press freedom index report for 2016 by the Human Rights Network for Journalists (HRNJ) has named the police force as the top violator of press freedom in the country for the fourth consecutive year. The report released yesterday at the Imperial Royale hotel in Kampala was meant to coincide with today's World Press Freedom day. Titled: "Tough times: Political intolerance stifles media," it states that police is responsible for 83 out of the 135 reported cases of violence against journalists within the past one year. Last year's presidential and parliamentary elections exposed journalists to unprecedented at- tacks with an increased number of female victims. "Police, other state agents and powerful individuals manipulated laws to suit their aims of curtailing media freedom and silencing journalists," the report states. 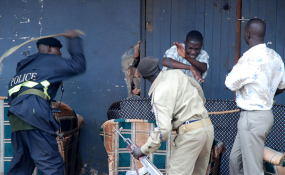 Some of the laws the report points out are criminal defamation and criminal trespass, which HRNJ-Uganda says are being used as tools of intimidation. The report further disapproves government attempts to license journalists. "HRNJ-Uganda was dismayed by the attempts by the media council, with support from UNDP, to conscript journalists to a mandatory registration exercise stemming from a legislation that is under challenge in the courts of law," the report reads. The report further noted that whereas many countries have progressively moved towards repealing criminal defamation laws, Uganda has maintained this law. The report also points out that media owners also abuse the rights of their employees by not paying them and defending them when they are under attack. Countrywide, Kampala is most affected by attacks on media houses and individual journalists which stand at 57 per cent, closely followed by areas of Buganda and Eastern Uganda both with 12 per cent. The violators of press freedom, according to the report, use methods like physical assault of journalists, malicious detention for hours in police cells, blocking access to news scenes, threatening violence and unfair hearing, among others. In order to reduce attacks on the media, the report recommends that police authorities should popularize the Prevention and Prohibition of Torture Act 2012 throughout the force. In 1993, the United Nations established the World Press Freedom day to celebrate the fundamental principles of press freedom; evaluate press freedom around the world, defend the media from attacks on their independence and pay tribute to journalists who have lost their lives in the exercise of their profession. On Friday, the African Centre for Media Excellence (ACME) organized a dialogue for media stakeholders at Churchill Courts hotel in Gulu town ahead of commemoration of the World Press Freedom day. Themed: "Freedom of expression and freedom of in- formation to foster more inclusive societies," the session tackled key challenges of the media in a digital era. It was organized in partnership with Northern Uganda Media Club and Uganda Human Rights Commission (UHRC). Martin Aliker, a businessman and community leader, challenged journalists to fight for their rights. "Is it freedom of expression or freedom after expression that we should be minding of at this time in Uganda?" he asked. "How do we protect the Stella Nyanzis of our world when there is always a force against literary expressions? Media should serve as a voice of the marginalized, which is the core of our vocation." Sam Lawino, a media practitioner in Northern Uganda, said laws have been tailored to favor the policymakers at the expense of journalists and this limits them in executing some roles of human interest. "We have media laws that look at the media as an enemy of the state instead of a fourth estate. A journalist is still beaten up and his gadgets taken away or even destroyed for capturing a story that does not suit the interest of certain people in society. Our colleagues get hurt but the remedies are not worth the pain we go through to get information for our audience," he said. In March, Buganda Road court magistrate Gladys Kamasanyu convicted Joram Mwesigye, the former Old Kampala divisional police commander (DPC), for assaulting a journalist, Andrew Lwanga. However, Mwesigye escaped the one-year jail term when he paid the Shs 5m compensation to Lwanga on top of a Shs 1m court fine. Some sections of the media were not impressed with how the case was handled considering Lwanga's permanent disability as a result of the assault and the impact it will have on his livelihood as a freelance journalist. Patience Aber, a news editor with Radio Rupiny, thinks better media laws to protect and mind of safety of journalists should be put in place. "We have trained journalists while others need more training but the law should also protect us such that when we are doing our job as journalists, we mind about the professionalism in doing our work, and not safety." During the dialogue, journalists voiced their concerns about media laws in Uganda that re- strict their freedom of expression on social media plus criminalizing their work. Fionah Opoka Abalo, a Gulu-based human rights officer with UHRC, says the media can change the media laws if they follow the right channels. "I know that laws in Uganda have weaknesses but you have to operate within the law. If you think the laws are oppressing you, maneuver to make them favor you," she said. Meanwhile, Martin Okoyo, the Gulu DPC, expressed disappointment with some media houses that abuse their freedom to disseminate information to the masses. "Some radio stations have be- come battlefields and the moderator is the referee. They do not care about use of language and the audience listening at that time. For us, if people fight in the studio, we shall arrest the presenter for allowing use of inappropriate language that misleads the masses," he said. "Freedom of the press is a challenge because there are those who think they are immune to the law. Always mind your duties amidst the law." According to Dr Mura Okullu, a retired commissioner for information at the Office of the President, journalists have to represent a voice that mirrors the conscience of the common man and pursue positive activism through investigative journalism to bring an idea to its logical conclusion. Okullu believes this will evade oppression of the media and make local issues relevant in mainstream media in the advent of diverse means of accessing useful information, especially social media. "Journalists need to investigate more than report in this era of social media. You must be cool headed to investigate and come out with good stories that you can easily defend with factual evidence." Apolo Kakaire, an official from ACME, advised journalists to take personal initiatives in developing their competencies to produce good work and protect their originality. He said journalists' challenges can only be overcome if they form or join media associations that can protect them from injustices in line with their profession. So, as the rest of the world commemorates World Press Freedom day, the bigger question for Ugandan media is; to what extent can the struggle to enjoy freedom of expression be achieved? Copyright © 2017 The Observer. All rights reserved. Distributed by AllAfrica Global Media (allAfrica.com). To contact the copyright holder directly for corrections — or for permission to republish or make other authorized use of this material, click here.